Braised lamb shanks. Meltingly tender, rich, delicious. And hard to mess up. Browned meat, aromatics and stock. Simmer gently for a couple hours and you have a meal worthy of a special occasion. Slow food is good food. This recipe is from a PBS show from the dark ages before the internet. Used to be if you wanted to learn about cooking you either bought books or watched TV. PBS was the best back then. Still is if you really want to learn about food. The show was “In Julia’s Kitchen with Masterchefs” and it was a revelation back then. This recipe belongs to Joachim Splichal – now famous for Patina in Los Angeles. 25 years later I still have my dog-eared scrap of paper – repeatedly stained – from which I make this recipe. I’ve never found a better recipe in all these years. 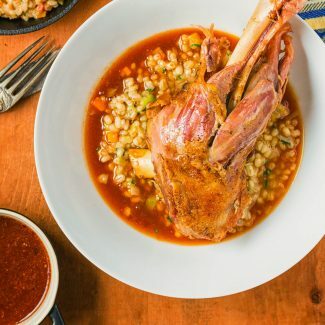 Serve it with barley risotto (as pictured), mashed potatoes, pureed white beans with garlic – just about anything. Braised carrots make a nice side. Veal stock really adds richness and depth to this dish but chicken stock will work in a pinch. Braised lamb shanks with aromatics. Tender lamb and a deeply flavourful sauce. Just the thing for special occasions! Brown the lamb shanks on all sides. This can take 10-15 minutes. Cook the onion, leek, carrot, shallot, and garlic until onion is translucent. Add tomato, white wine, thyme and about a teaspoon of salt and cook another 3-4 minutes. Return the lamb to the pot, add the veal stock and enough chicken stock to just cover the lamb. Cover and simmer for about 2 hours, until the lamb is tender. Remove lamb from pot and tent with foil. Strain the sauce through a sieve, pressing down on the aromatics to extract as much flavour (and maybe a bit of texture) as possible. Wipe out the pot and return the strained sauce to it. Reduce liquid, over moderately high heat, to about 2 cups. Taste and adjust salt as needed. Off heat, stir in 2 Tbsp butter. Serve lamb over barley risotto, pureed white beans, mashed potatoes or other "starch" and ladle sauce into the dish.